QuizUp, the trivia app from Plain Vanilla Games, is celebrating passing its five million player milestone just weeks after it first launched for the iPhone. The success and phenomenal rate of growth are likely due to the baked-in social features which make it a doddle to challenge friends or strangers alike. 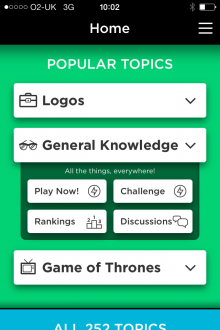 According to the company, the average QuizUp player is spending 30 minutes using the app per day “playing matches, browsing topics, messaging friends and participating in discussion boards”. To date, over 11 million messages have been exchanged through the QuizUp app, it added. In addition to attracting huge numbers of players, the Icelandic studio has also attracted a Round B investment totalling $22 million from Tencent Holdings and Sequoia Capital. Despite its undeniable popularity, shortly after launch the company was forced to respond to controversy surrounding the sending of user data in plain text and the use of ‘ghost’ players. Nonetheless, it’s obviously impressing a lot of people – $22m is a frankly staggering amount for what is essentially a quiz app among hundreds of others.